They say breakfast is the most important meal of the day. And, when you are on a getaway, why not indulge in breakfast, making sure you store enough calorie reserves for whatever the day may bring. 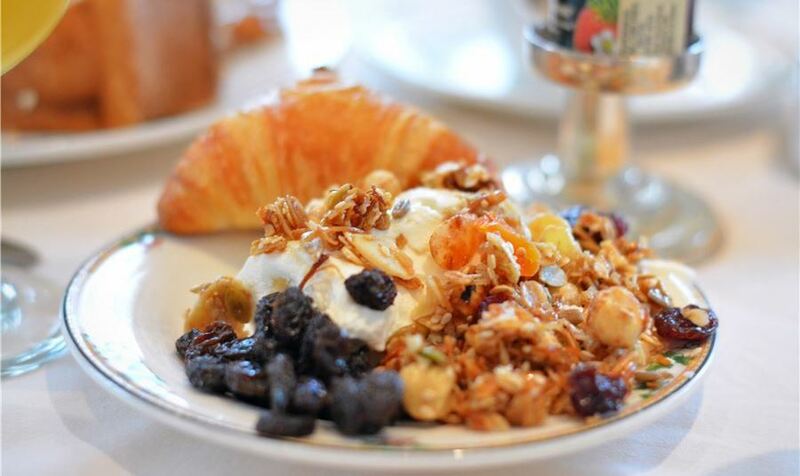 At The Otesaga, guests love our breakfast, and not only because it is included with your stay. Our team of culinary experts serves up enticing, hot food each morning, with freshly baked pastries, seasonal fruit, and of course, bottomless coffee and tea. There’s something for everyone, no matter what your favorite breakfast food is - even the kids. Over the years, we’ve learned what all the guest favorites are. We start the day off right for conference attendees, those headed to Dreams Park, those ready to explore the area museums, those planning a round of golf and more. Here are some highlights of what we offer every morning in Glimmerglass. As you can see, there are so many options! So, no matter how long your stay is, you’ll never get tired of our delicious morning buffet. We look forward to serving you a delicious breakfast on your next stay. Inside Glimmerglass, enjoy the stunning lake views, time with friends and family and prepare for day’s adventures in Cooperstown. Or, take your breakfast on the veranda, with serene, uninhibited views of Lake Otsego. Either way, sit back, relax and enjoy what we do best - gracious hospitality.